The March scientiae carnival focused on role models for women scientists. There are a lot of great stories, so you should definitely go follow the links from Liberal Arts Lady's post. While I missed the deadline for the March carnival, I'd like to talk a bit about my dad, who always encouraged my own study of science. 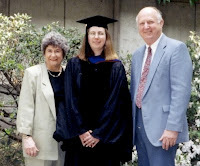 Dad received his bachelor's degree in civil engineering from UC Berkeley in January of 1958. He worked at the same public water agency for 32 years, working his way up from Junior Engineer to Assistant Chief Engineer in the planning department, the position he held when he retired in 1990. He was always supportive of whatever my brother and I were interested in, and that, for me, was science, particularly biology. He helped me with homework if I asked (although that wasn't very often) and with any class project that required assembly or engineering. I always felt like he found the topics I was interested in interesting too, and that there was no reason why I couldn't pursue any field I wanted to. When I was in high school he talked about his own college days; about how much he disliked taking organic chemistry (if I remember correctly, was eliminated as a general engineering requirement after he had already taken the class, which is how he ended up in water-related engineering), and using slide rules, and the fun times he had there. Some of that we probably talked about when I was actually in college - after almost 25 years, it's kind of hard for me to remember. He was always there encouraging me through both college and grad school. And he was a great role model - he worked hard, always made sure what needed to be done was done well, made sure that he had time to spend with his family, and was happy to lend a hand to friends. He took an early retirement, and the last 18 years he and mom have traveled all over the world, spent time on his hobbies, did a bit of consulting at his old job and generally enjoyed life. I think that's hard to beat. Dad passed away on on February 28th. At his memorial service several people came up to me and told me how proud he was when I got my Ph.D. For some reason that brought on tears more than any other comment. I'm having a hard time even writing this now. I also learned that he was welcome to women entering both his male-dominated engineering department, and more recently, his male-dominated hobby. I'm not at all surprised. I'm very sorry to hear about your father, but it's wonderful that you have such great memories to carry with you. Thanks for posting sis. I know dad was so proud of all you have done as I am as well. He was a great dad. Thank you for sharing this with us. Awww, Peggy, HUgs to you sweetheart. He did a great job with parenting as is evident at how wonderful you turned out . speaking of dads, I think, My dad always wanted me to be the best. He never said not to paying for anything education related or otherwise. I remember going to the bookstore and wanting to purchase all kinds of books and he for one would never say no . My mom always also did the same, to encourage me to study and learn and understand. Good parenting definitely goes a long way. Hugs to you sweetie. Parents get old , they pass, but their spirit lives on in us as children. Thanks for your kind words, everbody.